Q3. What was the level of satisfaction in 2017, and what are the improvements/changes SSF would like to see, compared to 2017? A3. SSF was satisfied with the overall results from 2017. One disappointment was that the number of no-shows on the night of the count was too high. The quality of the PIT count very much depends on the number of survey teams that can be dispatched. So, SSF is interested in any and all suggestions to increase recruitment and ensure attendance on the PIT night. Q4. Is there any documentation including volunteer/staff debriefing feedback from the 2017 session? A4. A debrief document from the 2017 PIT count is posted HERE. Q5. Are there documented maps from 2017 to be used as starting point? A5. Another contractor overseeing and administering the PIT methodology will be responsible for selecting areas to be canvassed and the drawing of walking maps for those areas. Q6. Does your survey exceed HUD guidelines with supplemental questions? A6. The survey has not yet been completed. It will ask questions beyond the minimum required by HUD. Nonetheless, a key goal in survey construction will be to minimize the time required to administer a survey. Q7. Describe your approach in the past two COC efforts, would it be: Point in time, next day, plant and capture, or is it a hybrid? A7. Currently, the plans are to conduct a one-night point-in-time count. The survey will include some questions that will allow for a plant and capture estimate. Options for including a next day count for specific sub-population are still under review. Q8. Does your count track survey refusals, and if so has that rate been growing? A8. We do not have data on refusal rates in prior PIT counts. Q9. Have you determined if the data quality gathered by team volunteers is of same/better quality than individuals? A9. Previous PIT counts have only sent out canvassers in teams. So, Sacramento has no experience with individual canvassers. Q10. Does show/completion rates for individual compare favorably to team volunteers? A10. Previous PIT counts have only sent out canvassers in teams. So, Sacramento has no experience with individual canvassers. Q11. Will you retain volunteer contacts in a database post event? A11. Yes, we will include volunteers in Sacramento Steps Forward database of community contacts. Q12. What is the timeline milestone to finalize the 2019 survey question structure? A12. Another contractor overseeing and administering the PIT methodology will be responsible for developing the survey and the survey administration technology. The deadline for the survey will be decided once that contract is finalized. Q13. Is there any documentation listing key contacts and locations available for meetings? A13. Yes, there is information on these issues in the debrief document referred to in Question #2. In addition, SSF staff will be available to help with identifying key contacts sand locations. Q14. Are there samples of the prior orientation/ training? A14. Yes, we will be able to share PowerPoint slides from last year’s trainings. Q15. Have any attempts/consideration been made to direct volunteers to specific on demand online (not live) pre-orientation training? A15. Online training were not employed in 2017. Nonetheless, SSF is currently producing online trainings and could assist in the production of a module for this PIT. Q16. Is it fair to assume the training should include sectors on: navigation- map reading, personal security, data accuracy and security, answering questions of any reluctant subject knowledge, overcoming objections/stressing importance of data, offering information on local resources? A16. This list is almost complete. The one other issue will be training on the use of the on-line survey tool. Q17. Will the enumerator volunteers be issuing participation gifts at the time of interview? A17. Yes, we will be providing gift cards to survey respondents. Q18. Any special training language/sensitivity for immigrant respondents around privacy/ICE prevention? Q18. No special accommodations were provided in past PIT counts. Efforts will be made to match possible second-language needs with the language capabilities of volunteers. Q19. Is there an expectation that enumerators will work in pairs in any high risk areas? A19. Volunteers will be deployed in teams in all areas. Q20. Which dialects should we be prepared to serve? A20. No special accommodations were provided in past PIT counts. Efforts will be made to match possible second-language needs with the language capabilities of volunteers. Q21. Are volunteers provided with event specific identification credentials? A21. Volunteers in past PIT counts have not been provided with specific credentials. Q22. Is there a preferred-tested online survey tool? A22. Another contractor overseeing and administering the PIT methodology will be responsible for the choice of the survey tool. Q23. Is the expectation that the data will be easily exportable into your database? A23. Another contractor overseeing and administering the PIT methodology will be responsible for data cleaning and analysis. Q24. Is there an identified source for loan devices for those without suitable phones? A24. Another contractor overseeing and administering the PIT methodology will be responsible for providing suitable devices if volunteers do not have a suitable phone. Q25. What are the privacy concerns for the data collected? A25. The survey will collect minimal identifying information to check whether individuals are double counted in the PIT count. This information is not made public to protect the privacy of survey respondents. Q26. Can you rank the key benefits to SSF which the media/ communications plan is designed to facilitate (volunteer recruitment, donors, public cooperation? A26. The media campaign is primarily intended to maximize the number of canvasser who volunteer and to ensure attendance on the night of the PIT. Other goals include improving the brand identity of Sacramento Steps Forward and communicating the central role that Sacramento Steps Forward maintains in homelessness policy. Q27. How are the volunteers rewarded/recognized post event? A27. Last year volunteers were provided a bag of token thank-you gifts when they picked up their materials for the count. SSF is open to alternative suggestions for thanking volunteers. Q1: Does the recommended budget have to cover the cots of gift cards to be distributed as incentives for survey participation? A1: No. Sacramento Steps Forward has a supply of gift cards on hand which can be used as survey incentives. Q2: Will the Volunteer Coordinator be responsible for collating, packaging and numbering all materials for each canvas team so that they are prepared to be distributed on the night of the count? A2: The production of materials will require some level of coordination with the PIT survey contractor who is designing the maps and other instructions. The volunteer organizer, nonetheless, will be responsible for putting packets together and distributing the packets to teams on the night of the count. 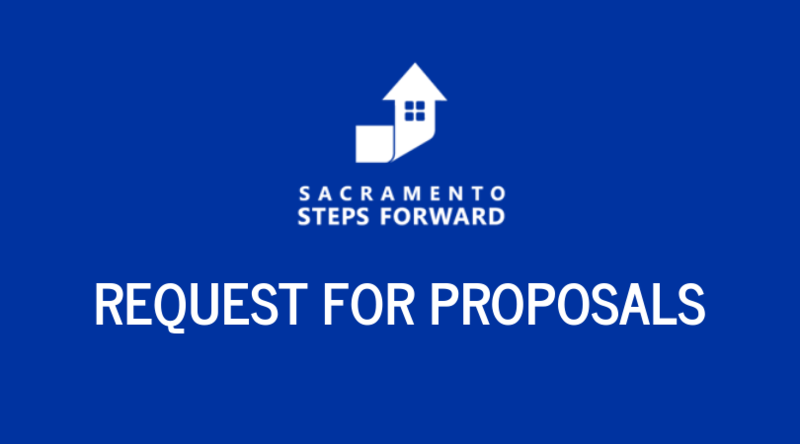 SACRAMENTO (Sept. 28, 2018) — Sacramento Steps Forward (SSF) released a Request for Proposals today seeking a qualified organization to provide Volunteer Coordination Services for the 2019 Homeless Point-in-Time (PIT) Count. Written questions are due October 5th 2018 by 5 p.m. Final proposals are due October 12th, 2018 by 5 p.m. The biennial PIT count is a county-wide census of people experiencing homelessness. It provides a snapshot of who is homeless on a single night. The U.S. Department of Housing and Urban Develop requires local communities to conduct this census every two years as a condition of receiving federal funding for their Homeless Continuum of Care (CoC), for which Sacramento Steps Forward is the lead agency. Sacramento Steps Forward (SSF) is in need of a volunteer coordinator who will recruit volunteers, ensure that they attend a mandatory training session, and most importantly, manage volunteer teams on the night of the count. The organizer will work with area organizations, colleges, and universities to promote the volunteer opportunity through their networks. This recruitment process will entail, with the coordination of SSF, the development of emails and other recruitment materials that will be shared with partner organizations. The organizer will be responsible for providing a web-based tool for volunteer registration, for collecting contact information from volunteers, tracking volunteers, and sending out invitations to trainings and the final event. SSF can host the tool on its website, and can provide support for these functions if necessary. This contract will begin as soon as applications are reviewed and a contractor is selected. It will run through January of 2019. The amount budgeted for these services based on the previous PIT count is $20,000. Click HERE to access the full RFP for Volunteer Coordination Services to support the 2019 CA-503 CoC Point-in-Time Count including proposal requirements and submission instructions.